The St. Louis Cardinals 2006 season was the team's 125th season in St. Louis, Missouri and the 115th season in the National League. The season started out with a bang, as the team raced out to a 31-16 record by late May. Momentum would be slowed by injuries, as starting pitcher Mark Mulder was lost for the year, while center fielder Jim Edmonds and shortstop David Eckstein missed large amounts of playing time in the second half. Poor performance from several key players also hampered the team: starting pitcher Jason Marquis compiled a 6.02 ERA, starting pitcher Sidney Ponson was cut due to ineffectiveness, closer Jason Isringhausen blew ten saves before undergoing season-ending hip surgery in September, and catcher Yadier Molina had a poor offensive year, batting .216. All this led to a difficult season, despite that quick start, one that included two eight-game losing streaks (the longest such streaks for the franchise since 1988) and a seven-game losing streak, losing months in June, August and September, and an 83-78 record, the worst for the Cardinals since the 1999 team finished 75-86. However, that record was still good enough to finish first in a weak National League Central. On the season's final day, the Cardinals made the playoffs for the sixth time in the last seven seasons, edging the second-place Houston Astros by a game and a half. Once the playoffs began, the lightly regarded Cardinals surprised baseball fans everywhere by beating the San Diego Padres in the four-game Division Series, beating the New York Mets in the seven-game NLCS, and beating the Detroit Tigers in the 2006 World Series four games to one, winning the tenth, and probably most unlikely, World Series championship in franchise history. Their .516 winning percentage is the lowest ever for a World Series champion. This season ironically contrasted with 2004 in that that team were considered overwhelming favorites but were swept in the World Series, resulting in a bittersweet three-year period for the Cardinals. Monday, April 10, saw the Cardinals' home opener, and the first Major League game in the brand-new Busch Stadium. The Cardinals came back from an early deficit to beat Milwaukee 6-4. Pujols had a home run (his fourth in eight games) and Mark Mulder won his first game of the year. The first game played at the new Busch was between two of the franchise's minor league affiliates, the Springfield Cardinals and Memphis Redbirds on April 4. 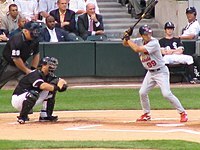 On April 16 against the Cincinnati Reds, Pujols continued his hot start, hitting three home runs, including a walk-off two-run homer in the bottom of the ninth to give the Cardinals an 8-7 victory. The three-dinger day was the second of his career and gave him eight home runs in the Cardinals' first twelve games. St. Louis would continue playing well through April and finished the month with a record of 17-8. The Cardinals continued to play well in the month of May, but injuries began to accumulate. Relief pitcher Ricardo Rincón, on the disabled list since April 28, had season-ending shoulder surgery on May 12. Ponson went on the disabled list with a strained muscle in his right arm, and ace Chris Carpenter went on the DL with bursitis at the end of the month. Rookie Anthony Reyes got two callups to make emergency starts for Carpenter and Ponson, earning one victory and one no-decision. Jim Edmonds missed time with an abdominal infection and many of the players fell victim to a flu bug in the clubhouse. But Albert Pujols continued his great year, hitting 11 home runs in May after 14 in April, Jason Isringhausen was 10-10 in save opportunities, and the team went 17-11 for the month and finish May with a record of 34-19, fifteen games over .500. On May 28, Mulder, who had been very effective for most of the first two months of the season, was tagged for eight runs in 4.1 innings as the Cardinals lost to San Diego 10-8. It would be a sign of things to come for St. Louis' #2 starter. St. Louis then traveled to Chicago for a series against the defending world champion Chicago White Sox. They lost the opener 20-6. Mark Mulder's ERA rose to 6.09, and two days later he went on the disabled list. They lost the second game 13-5, with starting pitcher Jason Marquis giving up all thirteen runs. The next night, rookie Anthony Reyes, called back up to the big leagues with Mulder injured and Ponson banished to the bullpen, threw a one-hitter—but that one hit was a home run by Jim Thome, and the Cardinals lost 1-0. Reyes' gem was also the first game back for Albert Pujols after eighteen days on the disabled list. After the sweep by the White Sox the Cardinals were swept by the Detroit Tigers. Two more losses to the Cleveland Indians extended the streak to eight losses in a row, the longest such streak for a Cardinal team in 18 years. They finally snapped the streak with a 5-4 victory over Cleveland on June 29. For the month, St. Louis went 9-16 and fell to eight games over .500 at 43-35. The yo-yo season continued. The Cardinals won seven in a row and 13 out of 16 in the middle of July (a surge largely fueled by a sweep of all seven games with the Los Angeles Dodgers in 2006) and by July 26, they had regained their previous high of 16 games over .500, at 58-42. However, the end of the month saw a four-game sweep by the Cubs at Wrigley Field and a losing streak that would extend into August. St. Louis went 15-11 in July and finished the month at 58-46. The Cincinnati Reds continued to dog the Cardinals' footsteps, sitting 3.5 games out of first place at the end of July. Pitching continued to be problematic for the Cardinals in August. Mark Mulder, attempting to come back from his shoulder injury, made two starts towards the end of the month, got hit very hard both times, and return to the disabled list, where he would stay for the rest of the season. He ended the worst year of his career with a 7.14 ERA. Jason Marquis' miserable year got even worse, with a 6.75 ERA for August. New acquisition Jeff Weaver followed up his 6.46 July with a 5.67 August. Closer Jason Isringhausen also struggled, blowing two saves, taking three losses and posting a 5.06 ERA for the month. Injuries took their toll on position players as well. Jim Edmonds missed half the month with post-concussion syndrome and David Eckstein went on the disabled list with a strained oblique muscle. The Cardinals signed Preston Wilson, who had been released by Houston, to fill the hole caused by Edmonds' injury. The Cardinals' strange, up/down season would get even stranger in the final month, as the team staggered to the finish while trying to avoid a shocking collapse. As August passed into September, Eckstein was still on the DL and Edmonds was still absent from the lineup with post-concussion syndrome. On September 3, Pujols had his second three-homer game of the season and third of his career, as the Cardinals beat Pittsburgh 6-3. However, two days later the Cardinals were nearly no-hit; Ramón Ortiz of the Washington Nationals took a no-hitter into the ninth before Aaron Miles' single spoiled it. Ortiz settled for a 4-1 victory. As the season wound down, St. Louis seemed to run out of gas. Edmonds and Eckstein missed almost the whole month with their injuries. Duncan, who'd made major contributions to a slumping offense in July and August, slumped to a .212 September. Even worse, Scott Rolen, the second-best hitter on the team for five months, went into a terrible slump and hit .227 for the final month. Encarnacion hit .238, Belliard .219, and Molina .224. The only players contributing offense in the final month were Pujols and Scott Spiezio, whose power surge allowed him to post a 1.042 OPS for the last month of the season. On the pitching mound, Marquis ended his awful year with a dismal 7.25 September. His 6.02 ERA in 2006 ranked dead last in the National League amongst pitchers who qualified for the ERA title. Jason Isringhausen, who had been struggling all summer with a deteriorating hip, was finally lost for the season after blowing his tenth save of the year on September 6 against Washington. Rookie Adam Wainwright assumed the closer's role for the last few weeks of the season. On September 27, St. Louis' seven-game lead had been sliced to 1.5 games over the hard-charging Astros. Houston won again that day, their eighth in a row. Trailing 2-1 in the bottom of the 8th inning to the San Diego Padres with two on and two out, Albert Pujols hit a three-run homer, his 47th of the year. New closer Wainwright made it stand up, and the losing streak was over. It was Pujols' 25th game-winning hit of the season. However, the next night Jason Marquis had one last terrible start, the Cards lost to Milwaukee 9-4, and the lead over the Astros shrank to 1/2 game. The sports world was rife with memories of the 1964 Philadelphia Phillies, who led by 6½ games with 12 to go and lost ten in a row to lose the pennant to, ironically, the Cardinals. On the 29th St. Louis beat Milwaukee 10-5 and the Astros lost to Atlanta, snapping their nine-game win streak and widening the lead to 1.5 games. On the 30th, Scott Spiezio hit a bases-loaded triple in the bottom of the 8th inning and the Cardinals beat Milwaukee 3-2. Needing only a win in Game #161 against Milwaukee on October 1, St. Louis lost 5-3, but the Astros had already lost 3-1 at Atlanta. The Cardinals had narrowly avoided collapse and won the NL Central with an 83-78 record. Had the Astros won their last game, the Cardinals would've had to play a rained-out make-up game against the San Francisco Giants to determine the tie breaker between the Astros and the Cardinals. The Cardinals began the NLCS as huge underdogs to the New York Mets. The Mets won fourteen games more than the Cardinals did in 2006. Their offense scored 53 runs more than the Cardinals' did. Their pitchers allowed 31 fewer. In head-to-head contests during the season, the Mets won four of six from St. Louis. Also, by virtue of the better record, the Mets would have home field advantage. However, the series would be hard-fought by both sides. New York won Game 1 2-0 behind the pitching of ace Tom Glavine and a two-run homer by Carlos Beltrán. The Cardinals won Game 2 9-6 by scoring three runs off Met closer Billy Wagner in the top of the ninth inning, the rally started by a home run from light-hitting (16 career HR in 960 at-bats) So Taguchi. St. Louis won Games 3 and 5 and New York won Games 4 and 6, setting up a winner-take-all Game 7 in New York. Light drizzle fell all game, increasing to a light rain in the later innings. The Mets scored in the bottom of the first on a double by Beltran and a single by Wright, but would not get another hit until the ninth. The Cardinals evened it up at 1-1 in the second on singles by Molina (who followed up his Division Series success by hitting .348 in this series) and Edmonds and a sacrifice bunt by Belliard. There the score would stay for seven innings, thanks in part to Met left fielder Endy Chávez, who made a leaping catch of Scott Rolen's almost-home run in the sixth and doubled Jim Edmonds off of first. The game was still tied with one out in the top of the ninth when Rolen singled. Molina, batting next, (and like Taguchi not a home run hitter, with 16 in 937 big-league at-bats), hit a two-run homer over the left field wall to give the Cardinals a 3-1 lead. In the bottom of the ninth inning, the Mets loaded the bases with two out on singles by José Valentín and Chavez and a walk to catcher Paul Lo Duca. That brought to the plate Cardinal-killer Carlos Beltrán (18 for 51 with seven home runs against St. Louis in the 2004 and 2006 NLCS), who in the regular season hit 41 home runs and drove in 116 runs. St. Louis' rookie relief pitcher, Adam Wainwright, installed as closer only one month before, struck out Beltran on three pitches (the last a curveball looking), and the Cardinals won the series and the 17th National League pennant in franchise history. Starting pitcher Jeff Suppan was named NLCS MVP. 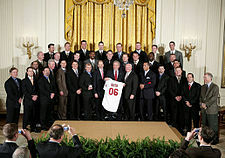 The Cardinals are honored as World Series champions by President Bush at the White House on January 15, 2007. St. Louis had been an underdog against the Padres, and won. They had been a prohibitive underdog against the Mets, and won. That did not prevent them from being an underdog for the third time against the American League champion Detroit Tigers, who had won 95 games in the regular season, knocked off the New York Yankees in the Division Series and swept the Oakland Athletics in the ALCS. Bob Nightengale of USAToday expressed majority opinion when he said "Tigers in three". ^ Latsch, Nate (May 12, 2006). "Notes:More improvements for Busch". The Official Site of the St. Louis Cardinals. Retrieved November 28, 2007. ^ Leach, Matthew (May 27, 2006). "Notes:Edmonds out of lineup". The Official Site of St. Louis Cardinals. Retrieved November 19, 2007. ^ Leach, Matthew (May 26, 2006). "Notes:Ailing Cards regroup after off-day". The Official Site of St. Louis Cardinals. Retrieved November 28, 2007. ^ "SportingNews.com - Your expert source for MLB Baseball stats, scores, standings, blogs and fantasy news from MLB Baseball columnists". Archived from the original on October 1, 2007. Retrieved March 19, 2007. Wikimedia Commons has media related to 2006 St. Louis Cardinals season.